George Santos always knew he wanted to be a doctor. “In high school, I volunteered to do first aid for parades and other functions. I even shadowed a midwife (my aunt) and helped deliver babies,” Santos says. Santos planned on becoming a surgeon until a psychiatry rotation at the University of Texas Medical School at Houston pulled his interest in a new direction. He found he enjoyed the interaction with the patients. “In psychiatry, you’re more involved with patients’ lives, and you get to understand their whole life story,” Santos says. Today, he is the executive medical director and chief medical officer of Houston Behavioral Healthcare Hospital (HBHH), a new psychiatric facility that provides both inpatient and outpatient care for adults and adolescents. Santos is particularly proud of the culture he and the hospital’s CEO, Lucinda DeBruce, have established at HBHH. Their three guiding principles are excellence for the sake of excellence, selfless giving, and fostering a family feeling among the staff. “Whenever we do an orientation, we have everyone mention something interesting about themselves. It helps create personal connections between colleagues,” Santos says. Thanks to leadership commitment at HBHH, Santos says the staff is fully committed to the culture as well. “At a recent open house, the staff really sold the hospital to potential employees. Our staff has recruited more people than any advertisement ever could,” Santos says. Before the hospital opened, Santos hired four social-work students from a local university to pose as patients, go through the system for 24 hours, then report on their experience. “The students’ feedback helped us develop better processes, forms, and mechanisms for assessing and treating patients. Because the staff is involved in the development of the processes we use, they feel ownership,” Santos says. 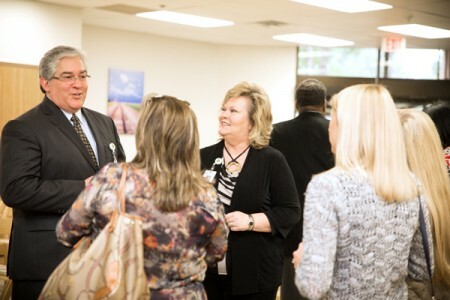 George Santos and CEO Lucinda DeBruce celebrated the opening of the HBHH in February, 2014. A major challenge facing providers of psychiatric services in Houston is the extremely high uninsured rate in the state. “Texas has become a very conservative state that doesn’t support the Affordable Care Act and has not expanded Medicaid coverage. This means that by time the patients come to us, they are very sick,” Santos says. Another issue of concern to Santos is the corporate practice of psychiatry. Many of the hospitals are now managed by a relatively small number of corporate entities. Unfortunately, their focus is often more on a business model than a clinical model. “Signature Healthcare, which runs HBHH, definitely has a clinical focus. I meet with the other medical directors in the company on a regular basis. It’s refreshing,” Santos says. Over the years, Dr. Santos has made a considerable amount of progress in the legislative area. He served for about 10 years on the Harris County Hospital District Board of Managers, one of the largest public health systems in the country. He regularly testifies on legislative matters regarding medicine and psychiatry, and is currently working on legislation to ban weapons in psychiatric hospitals. Since the 1960s, the focus in mental healthcare has switched to community-based care, but the money hasn’t flowed to provide community-based services. “The largest mental health institution in Texas is the jail system,” Santos says. “About 25 to 30 percent of all inmates in the Texas prison system are active psychiatric patients on psychiatric medications.” What Santos would like to see in the future is mental health parity in real terms and the expansion of Medicaid—which would mean earlier intervention. “We also need more psychiatrists—particularly for children—and more psychiatric beds,” he says. Santos says he can’t imagine ever retiring. Right now, he’s focused on developing HBHH as a premier hospital for psychiatric care and on connecting with the community through early intervention programs, parenting classes, and inpatient and outpatient services. “We’re well on our way to making that happen,” he says.